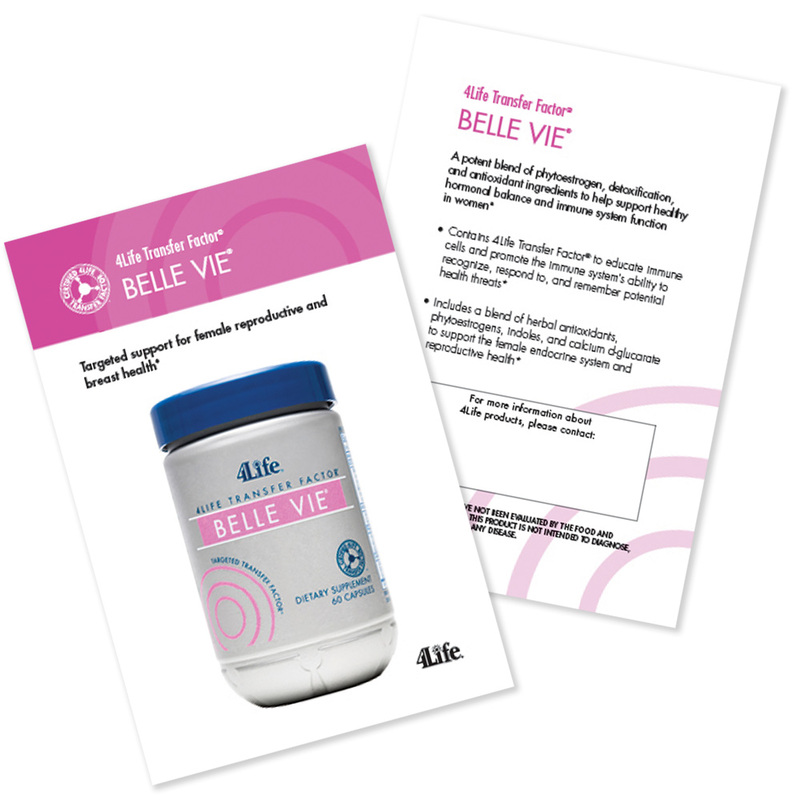 4Life Transfer Factor Belle Vie offers targeted support that goes beyond the ordinary with scientifically formulated compounds to promote female system health in women. It combines a blend of herbal antioxidants, phytoestrogens, indoles, and Calcium d-Glucarate and Transfer Factor E-XF? to assist the body in normal detoxification for superior gynecologic and breast health. Be proactive with Belle Vie for health and longevity. What makes Transfer Factor Belle Vie unique? Phytoestrogens, trace substances found in food which mimic and supplement actions of estrogen, offer a stabilizing factor that can sustain long-term reproductive health. Belle Vie includes lignans and isoflavones from Kudzu and Red Clover, all powerful phytoestrogens. Plant compounds called indoles, found in many cruciferous vegetables have been shown to support female cellular health by promoting proper cell growth and providing detoxifying benefits. Studies show that increased consumption of cruciferous vegetables like broccoli, cabbage and kale (which is the vegetable blend found in Belle Vie), is linked to increased rates of cellular breast health. Calcium d-Glucarate, included in Belle Vie, is a natural substance that nutritionally supports the body's ability to eliminate toxins and other potentially harmful elements.